In Emily St. John Mandel’s novel Station Eleven, a small group of actors and musicians wander through a post-apocalyptic landscape, bringing music and theater to an, empty land. Such is also the world of David Bösch’s dark, sad production of Monteverdi’s L’Orfeo, now in its first revival at the Bayerische Staatsoper, again with baritone Christian Gerhaher in an unusual star turn. While not explicitly post-apocalyptic, it is nonetheless a desolate, nocturnal version of our reality–one even the perky, ukulele-carrying spirit of Music fails to brighten. 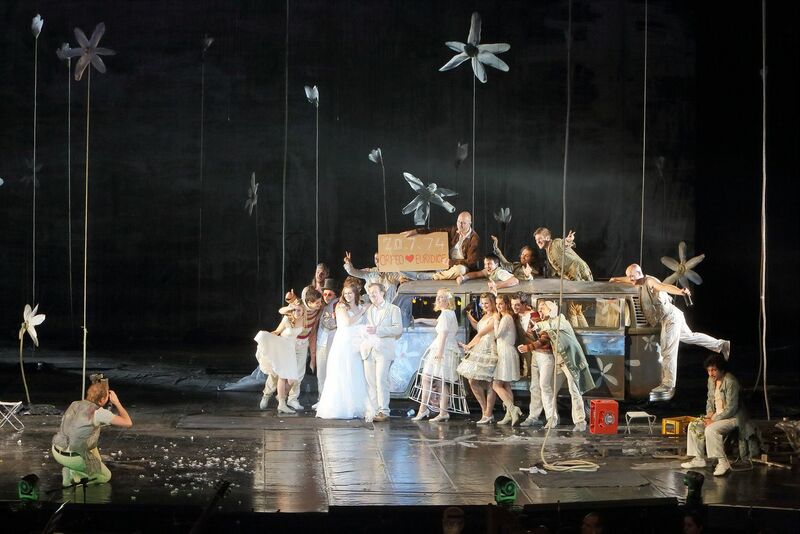 Like the ending of Don Giovanni, the finale of Le nozze di Figaro restores order and hierarchy. But, with the benefit of hindsight, we know that this peace between master and servants is a tenuous one, and only a few years later the underclass would not be so placated. Today, its title characters’ suggestions of insurrection may be less incendiary than they were at the opera’s premiere but they are instead indexical—well, sometimes, at least. The Ghost of French Revolutions Future occasionally haunted the two Figaros I saw recently*: the McCarter Theatre’s production of Beaumarchais’s play in Princeton and the Royal Opera House’s revival of Mozart’s opera in London.